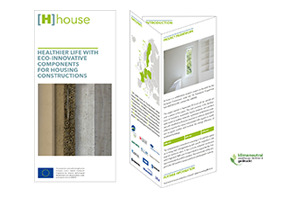 The main objective of the H-House project is to develop eco-innovative wall components for residential buildings that influence positively and improve the indoor environment quality of residential buildings, either new construction or renovations. The consortium is aware that the success of the project relies on both, the successful research and technological development carried out under WP2 – WP6, but also the future application of the developed solutions in real projects across Europe. A coordinated dissemination plan has therefore been developed that sets out a general strategy and provides an activity list for each partner that enables the timely communication of project goals and results. Interim and final project results will be published on the public website and be made available for download at the end of the project. Results will also be published in scientific journals and other relevant magazines. Participation in relevant trade fares, national workshops, seminars as well as training courses will be organised and published in the events calendar of the public website. In addition, the research institutes will present project outcomes to a wider audience during their ‘Open Days’. New ILCD compliant environmental datasets for all developed wall components, elaborated by the projects specialist for Life Cycle Costing and Life Cycle Assessment, will be made available free of charge on the ILCD platform. The LCA follows the ‘cradle to gate‘ perspective and will provide all meta-information on data collection and modelling principles. At the end of the project, the final developed building components will be produced as full-scale prototypes and exhibited for the public on two different demonstration sites, one in Poland and the other one in Italy.